We understand how important it is that your building reflects a clean and welcoming image. 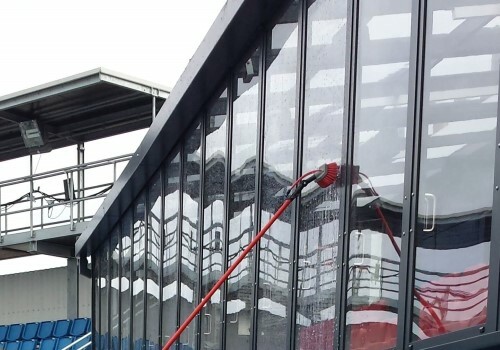 Shine Cleaning Solutions can undertake commercial window cleaning for a number of Public Sector Organisations, Facility Management Companies and Private Landlords, local Car Dealerships and many other commercial and industrial customers. We hold £5 million Public Liability Insurance. Our staff are licensed and police checked. Our staff are well trained, our operatives hold IPAF and PASMA licenses. We are SAFEcontractor Accredited, assuring you of the highest standards in health & safety. Factories, Warehouses and other Industrial Premises. Care Homes, Nurseries and Schools. Any other commercial or business premises. 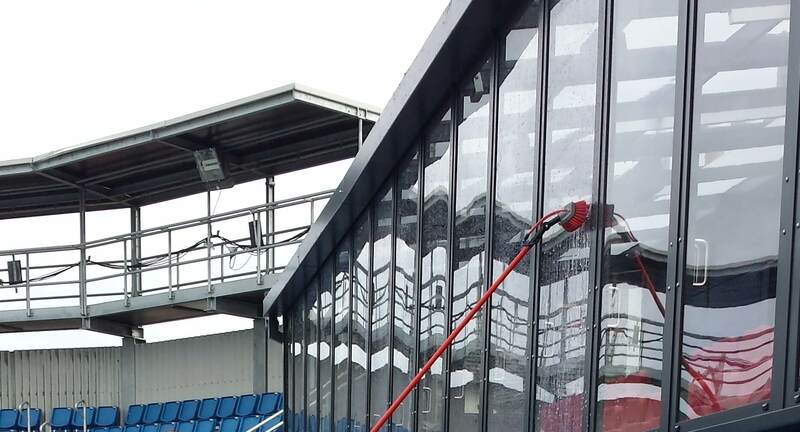 We can undertake all aspects of window cleaning, exterior building cleaning, cladding cleaning, canopy and atrium cleaning, and gutter and facia cleaning to ensure your building is presented at its very best. Using a wide variety of cleaning methods and techniques allows us to undertake any size of job. If you have more complex requirements which require specialist access, such as Mobile Access Scaffold Towers or Mobile Elevated Work Platforms (MEWPs), our IPAF and PASMA trained staff can undertake the works required. Our Dragonfly internal cleaning system can clean high level internal windows up to 40 feet without the need for specialist access equipment. Further information can be found here on our High Level Internal and External Window Cleaning methods. Cleaning is completed quickly and with the minimum of disruption to your workplace. We take pride in our flexibility and will go out of our way to clean your building at a time that suits you. Our experienced staff provide a high quality service whatever the size of your building, and are fully trained in the latest health and safety regulations. Whether you require a one-off clean or a regular clean please contact us on 01506 414452 or email us to request a quotation.